However if you let the fire poi wicks smoulder by allowing all the fuel to be used up then the KEVLAR® wick will burn away slowly and fall apart. Sunlight also degrades and darkens the color of KEVLAR® wick slowly over time. So it is good to have wick covers when using Fire Props during daylight, it also stops you getting your daytime clothes dirty from the residues on the wicks. Many people wrap some tin foil over the wicks and then put some colorful socks over that. 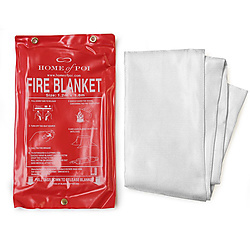 We also sell some fluffy covers which can fit over some common KEVLAR® fire toys. Larger Monkey Fists are available and are rather heavy with big flames requiring you to have big strong arms, not for the fainthearted. But wow what a show! Weka Fire poi are great for fire dancing beginners and those who prefer lighter weight Fire Poi. These are a simple design and should last a very long time. Larger versions of the Weka Fire Poi are called Mura Fire Poi and create a flatter flame with a big appearance. Another Great value for money Fire Poi. Snake Fire Poi have a huge flame so you will always need to keep them swinging otherwise you will get your hands and handles burnt. Not for beginners and they will restrict some of your tricks because of the size. Once spinning they create awesome walls of flame with huge visual appeal. Double and Triple Headed Fire Poi perfect for creating beautiful rings of flame, but again not for beginners as the flame is closer to your hands and you'll need to always keep them swinging. Their main strength is that they are very visually appealing. The smaller head versions are OK for most people but the larger heads will require more strength and endurance to keep the Fire Poi moving. Block and Twista Fire Poi are a more complex version of the Cathedral Fire Poi construction. By having a small size wick woven provides a more solid fire head and the multi layers and grooves create a larger surface area for mixing of the fuel and air. This means a more durable Fire Poi set with stronger Flames. Again like most of our sets we have a big selection of sizes available. All our Fire Poi sets come with free online Fire Safety advice and fire dancing instructional videos.